Simatic S7-1200 CPUs are available as standard and failsafe versions. They are scalable in terms of their performance and are equipped with integrated IOs, integrated PROFINET interface for programming, HMI connections, distributed IOs and distributed drive architectures. 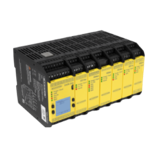 With the option to add up to eight I/O expansion modules, the XS26-2 expandable safety controller has the capacity to adapt to a variety of machines, including large scale machines with multiple processes. 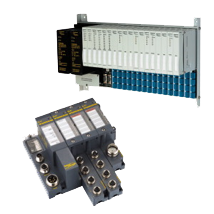 Panel or machine mounted expandable I/O for placing control at the point of use, available in a wide range of industrial communication protocols. XV Series of operator interface and Controller Development Software (CoDeSys) incorporates programmable logic controller (PLC) functionality and integrates directly with the Eaton SmartWire-DT system. Designed for OEM's, the XV Series combines control, visualization and data management tasks in a single device. Click here to reach out to us.